Despite the possibility of civil unrest, the pervasive apathy of so many New Zealanders have made the task of championing racist-free democracy untenable for the 1Law4All Party and its Board. The Board feels that by continuing to oversee the Party limping along in the way it is, members and donors may be given the impression that the Party has some chance of meaningfully opposing the rampant racism that is perverting NZ’s democracy. In 2013 and 2014, 1Law4All solicited members with the promise of having the name 1Law4All on every NZ ballot paper. That promise was broken. The present Board and several hundred stalwart members, donors and supporters have soldiered on since then, resolved to get the name 1Law4All on to every ballot paper and hoping to regain the credibility forfeited by the treachery of certain Board members of that time. The Party lacks the necessary administrative staff and general human resources necessary fight an election campaign. Therefore, with a truly heavy and somewhat exhausted heart, the Board has proposed the motion to wind up. However . . . Instead of winding up, 1Law4All could advertise for candidates for the 64 general electorate seats. With its current bank balance (May 2017) and subject to some modest conditions, 1Law4All would offer to pay 50% of the candidates’ $300 deposit. If that was achieved, 1Law4All would indeed be on every General Election ballot paper. But not its logo. Unfortunately, only registered political parties can use a registered logo beside electorate candidates names on ballot papers. There is no requirement for 1Law4All to be a registered political party to enable electorate candidates to use the party’s logo and name. Another option might be assisting with the legal fees of the Council of Outdoor Recreation Associations (CORANZ) in fighting the recently advertised 550+ applications for NZ’s coastline by part-Maori opportunists, using the Marine & Coastal Area Act. Yet another might be combining with another existing organisation that has the same or very similar objectives. Or election advertising to ensure the racism of National, Labour & the Greens is well-known by all NZ voters. Of course, that still leaves the problem of who to vote for. All are welcome to suggest more options for consideration. The Annual General Meeting of 1Law4All (Inc) is to be held at the Armitage Hotel, 9 Willow Street, Tauranga at 1.00pm on Saturday 24 June 2017. Has any approach been made to any other party on the list, with a view to combining forces? I think our views would be similar to those of many members of the Conservative party, which is making efforts to overcome its disastrous attempt at the last election. It’ll be so sad to see you disband. Is your stronghold still in Tauranga? Do you think it’s feasible to field a candidate in every electorate? What needs to happen to have a push to register as a party? Sad news indeed, I hope there is some way to hold it together. The NZCPR run by Dr Murial Newman springs to mind, it seems to be very well run and informative and has very similar values to 1law4all. I am a member/supporter of both groups and would hate to see all your hard work be wasted. It’s understood that Muriel has been approached in the past, but – from what is known – does not want to be involved directly in or with any political party. Or even form her own. Yes – it is sad. But as the item observed, the Board feels that it’s unfair to accept m’ship fees and donations when there seems to be almost no chance of 1Law4All stopping the racist juggernaut steam-rolling New Zealand’s democracy. Yes, I also like Dr. Muriel Newman. She’s very smart and well-organised. I’d support any organisation that she’s part of. I’ve been guilty of coming up with suggestions too, to the Board, but always done with a feeling of ‘guilt’ because it needed ‘others’ to put it in action. Basically we are just too small and too timid that none of us are getting protests to happen …. Haven’t seen the news today yet but the Part-Maori protesters in Tauranga the other day put us to shame. The Board has worked long selfless hours to a cause most of us reading their blog agrees with yet none of us who read and think about the way NZ is being segregated have organised any active ‘feet on the ground’ protests to the best of my knowledge, yet we talk about the apathy of others. Yes there are many reasons why not everyone can be an activist…. I am unable to myself I admit. So … a heartfelt thank you to the Board for putting themselves on the line and battling on despite the low membership energy; you’ve done a fantastic job and have Stood Tall at times. I appreciate that you’ve tried to make a difference. I DO wish there were someone able to carry on the fight once you wind up but aside from John Ansell I know of no-one & it may be too late now anyway. PS People with any written material about the grab for sovereignty in NZ by part-Maori IWI leaders, store it away for descendants who may one year wake up to what we’ve let happen to NZ and attempt to change that. I’m not too skilled at putting words down but hope you understand the points I’m trying to make. It’s generally understood that there are other proposals to be pondered at the AGM and that they get considered before any motion to wind up. The problem is, as has been tartly observed, time is not on the side of racist-free democracy. I am sorry if my message gave offence. I have admiration for the Board and all the Party has achieved. Your commitment is not doubted. Yes I realize the options that will be considered at the AGM. A sad reflection of our current times and at a time when corruption and reverse racism are the highest they have been for many years if not ever in New Zealand. We have our race relations minister saying that there is no room for racism in New Zealand and the government fully supporting part Maori racists. What a farce. Thankyou for the valiant effort and I can only hope a new more effective force will emerge, but I won’t hold my breath. While fully supporting the aims of 1Law4All I see little hope for any party with a one-theme agenda. 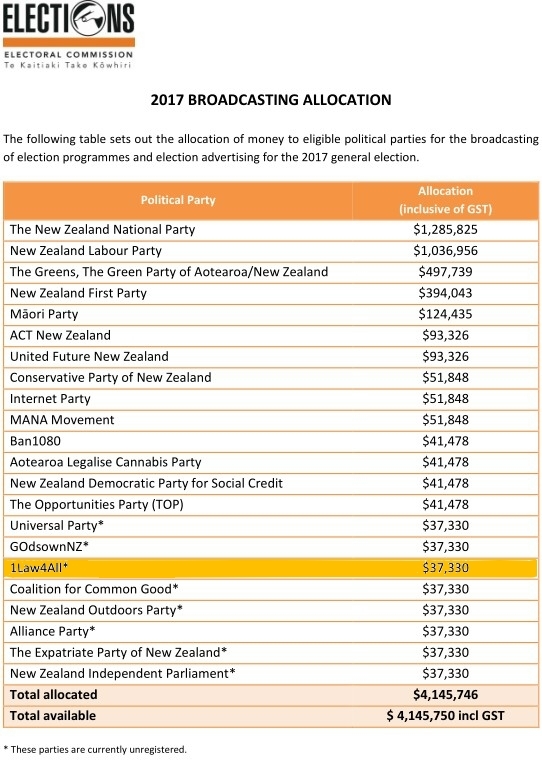 The only other parties with similar agenda are the Conservatives and NZ First, although the Conservative Party (for whom I voted last election) have turned me off with their anti-cannabis stance. I have never smoked weed and probably never will, but it’s medicinal qualities should be available to all who wish to grow their own few plants in a herb garden – a backward step for the Conservatives who originally stood for freedom of choice. The only real option is NZ First, with Winston advocating the removal of all race-based legislation. If he adds binding referendums to his list then he will get my vote. A good try guys, but breaking into the existing system would require a much broader electoral platform to attract a wider spectrum of voters. That is sad for NZ but great fantastic news for the maori racists and their band of PC liberal sycophants. NZers are definitely too apathetic and will one day wake up and wonder why they are not allowed to fish, or go to the local beach or why they must pay a maori-tax on everything. I guess I will remain a second-class citizen till I die. Until a party takes on the destruction of our history by the National Party to appease the Maori Party by destroying our history, then they are wasting their time. NZ taxpayers have been forced to fund the new He Tohu exhibit at the National Library, Wellington to the tune of $7.2 million dollars and no one has complained. Wake up New Zealand, you are paying to have your history destroyed and no one seems to care. I concur and I care Ross! So who do we vote for? Why not support ACT, as we do not want Winnnie the Poh there, or the Greens, or labour. Hi Geoff, I’ve supported ACT since their inception and I don’t understand why they don’t have a larger following so I’m ruminating voting for NZ First this year but don’t know if they’ll be fielding a candidate in Ohariu? Has NZ First expressed interest in any form ? Perhaps this will be to their advantage at the polls. It seems to me that to make a difference to the political scene votes have to be won in an election. That is the only time votes count for anything. In order for this to happen in any meaningful way, a movement has to have momentum and I believe it is too late for that now. My suggestion would be to research the party that best fits the aims of 1law4all and throw what assistance can be mustered behind that party for this election anyway. For the life of me, I cannot understand the apathy that is out there. What will wake them up? Hi Graeme, yes, I can’t understand this apathy either! But we really do need to do something! Where does ACT sit on these issues now? Are they a political party? It seems not. In line with “combining with another existing organisation …………” maybe the board should commence a dialogue with the Hobson’s Pledge group with a view to combining resources. I’m completely ignorant of the relationship between the two groups if indeed one exists. There is no relationship beyond believing in the principle of racial equality. Hobson’s Pledge [HP] is not a political party and – as far as 1Law4All knows, HP has no present aspirations to become a political party. I Agree with Peter, it certainly wouldn’t hurt to combine or even lend support to H P, they may not be a political party but they are out there with their signs and meetings taking it to the people. We could do worse. Running a political party takes lots of energy from a group of dedicated people and it also needs a leader which is appealing to the people at large if you are going to generate a groundswell of support. At present I feel that a single issue party is likely to only appeal to a relative few until there is clarity in the minds of the general public as to what is at stake here. Those groups like Hobson’s Choice, Democracy Action and NZCPR weekly (Murial Newman) are doing their best and do need our support if the project to form a political party isn’t achievable at the present time. It would also be disadvantageous for any such party to poll badly at the outset (and be denigrated as the views of a few nutters) which is a likely outcome if the ground work is not been done to reach the minds of the voting public. PS: I supported in a small way the NZCPR during their fund raiser to place one page ads in the Herald to highlight the water right issue etc and there was an delaying effect from that which resulted in Nick Smith being more devious with his repeat introduction of the bill. I believe strongly in the 1law4all cause … and that espoused by Hobson’s Pledge and Democracy Action. Surely we’d all be better off if we were united in the drive to re-establish true democracy in New Zealand.